Aquaflex is pleased to introduce a new high grade Deluxe Felt Underlay for 2017. 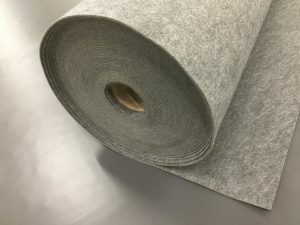 Thicker, tougher and more dimensionally stable than the Standard Felt, this is the underlay Aquaflex has used for many years for both commercial and domestic site lined swimming pools. It is now available in roll form for easy use with pre-tailored swimming pool liners. The Deluxe Felt Underlay is 400g/sq mt. as apposed to 300g/sq mt. for the Standard Felt underlay. This gives even more protection for the liner against any imperfections in the pool shell so is ideal for renovation work as well as for new builds. Please see our price book (page 16) for prices.